The Organisation of Eastern Caribbean States extends condolences to the Government and people of Saint Lucia on the passing of their beloved Prime Minister, the Right Honourable Sir John George Melvin Compton, on Friday 7th September 2007. 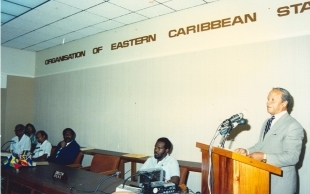 Sir John was, throughout his political life, a towering figure in the regional integration movement, and will be remembered in particular for the significant role he played in the establishment and growth of the Organisation of Eastern Caribbean States (OECS). Sir John was a strong advocate for the islands of the Eastern Caribbean proceeding jointly to political independence. The islands had experienced the benefits of working together through the West Indies Associated States (WISA) Council of Ministers which was established in 1966 following the demise of the West Indies Federation, and which grouped the Windward Islands of Dominica, Grenada, Saint Lucia and St. Vincent and the Grenadines and the Leeward Islands of Antigua and Barbuda, St. Kitts, Nevis and Anguilla and Montserrat. When the islands opted to pursue independence separately, beginning in the 1970s, Sir John was at the forefront of new integration arrangements for the newly independent micro states, which eventually led to the creation of the OECS. Faced with the daunting task of conducting their own external affairs, including managing and financing overseas diplomatic representation, the governments of the independent and soon to be independent Eastern Caribbean islands turned to Mr. Compton, then Premier of Saint Lucia, to chair a Committee to make recommendations on a model for joint overseas representation. The "Joint Overseas Representation Report" from Mr. Compton's Committee went beyond recommendations on foreign affairs and proposed the restructuring of the existing WISA Council into a new organization with responsibility for other areas of functional cooperation among the member states. That recommendation was adopted at a WISA Council meeting in Saint Lucia in 1979 and received final ratification at a follow up meeting later that year at which the mandate was given for the drafting of a Treaty to establish the OECS. Although Sir John was out of office when, what became known as the Treaty of Basseterre was signed in Basseterre, the capital of St. Kitts and Nevis in 1981 to establish the OECS, his return to the helm of the Saint Lucia government in 1982 brought renewed commitment and support for the new organization. 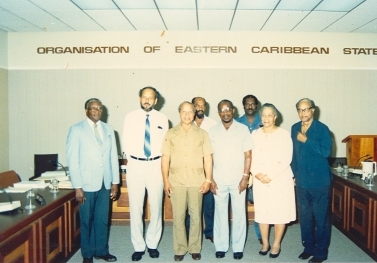 His close working relationship and friendship with other long serving OECS leaders during the early years of the organization, including Dame Eugenia Charles of Dominica, Sir James Mitchell of St. Vincent and the Grenadines, Dr. Kennedy Simmonds of St. Kitts and Nevis, Mr. Herbert Blaize of Grenada and Deputy Prime Minister Lester Bird of Antigua and Barbuda helped to create and sustain a number of enduring institutions of functional cooperation among the Member States of the OECS. The OECS is made up of nine Member States; Antigua and Barbuda, Dominica, Grenada, Montserrat, St. Kitts and Nevis, St. Lucia, St. Vincent and the Grenadines, Anguilla and the British Virgin Islands. The passing of Sir John Compton comes at a time when the OECS is moving steadfastly in the fulfillment of his dream of unity in the Caribbean, as its deepens the integration process in the form of the proposed Economic Union of the Eastern Caribbean. This will be a fitting tribute to his life and his work for the advancement of the peoples of St. Lucia and the OECS. We give thanks for his tremendous contribution in nurturing the spirit of true regionalism and integration, and we recognize him as being a true OECS giant.